myoldmac.net - Philips VideoPac Computer - Buy It ! Tested, in working order - including game cardridge "Golf" Nr 10. 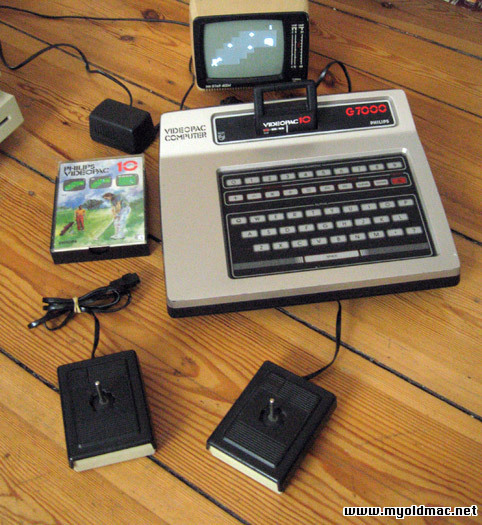 I have two of this consoles and now one is for sell - Console and Joysticks are tested and working well. It is the rare version with detachable joysticks and PSU! The Videopac computer was released by a number of Philips daughter companies all over the world, and is also known as the Magnavox Odyssey² in the United States, and the Odyssey in Brazil. Radiola released it as the Jet series, and Brandt released it under the Jopac name. Released by Philips in the late seventies of the previous century, this console might not have been the most advanced system of its time, but did manage to capture the heart of a lot of people. Magnavox (which merged with Philips in 1974) released the Odyssey² in 1978 to compete with brand new cartridge based video game systems like the Atari VCS, RCA Studio II or Fair-Child Electronics Channel-F. 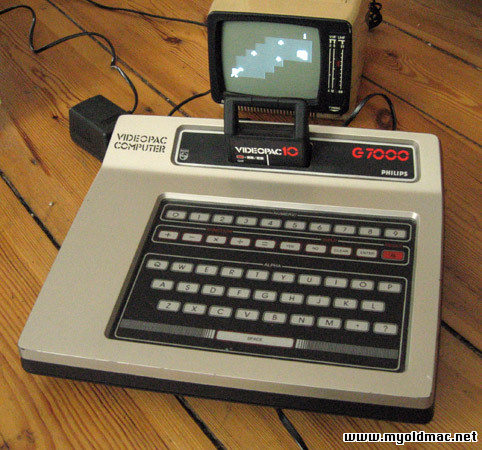 The Videopac G7000 is the european version of the Magnavox Odyssey². It was sold by Philips and was only available in Europe. Other brands (related to Philips) sold the same system in Europe too : Radiola JET 25, Schneider G7000, Siera G7000 and Philips C52 (only available in France). You turn on the console simply by plugging it in. The words "Videopac Computer" are stenciled to the left of the cartridge slot. Some G7000 models have hardwired black joysticks (with black fire buttons), while others have detachable silver joysticks. Like most European electronic devices, the G7000 runs on the PAL electrical standard. However, most (but not all) G7000 cartridges will still function on American Odyssey² units. It sounds pretty unreal, the name 'Philips Bulb Factory' on cartridges for a game console. But it was reality, al least with the first cartridges for the Videopac, also known as G7000. A console with which the Dutch firm Philips had reasonable success in Europe at the end of the seventies and the beginning of the eighties. The American equivalent, the Odyssey 2 manufactured by Philips' subsidiary Magnavox, even took the third place for some time, behind the Mattel IntelliVision and the Atari VCS 2600. Media: 2/4/8 kilobyte ROM cartridge; cartridge slot also used for expansion modules. Videopac.Net! The Home Base ! Voll funktionsbereit (getestet), mit Netzteil und 2 abnehmbaren Joysticks (selten). Der Computer wurde geprüft und funktioniert, ebenso die Joysticks. Kommt mit dem original Modul 10 - "Golf". Guter Zustand in anbetracht des Alters. 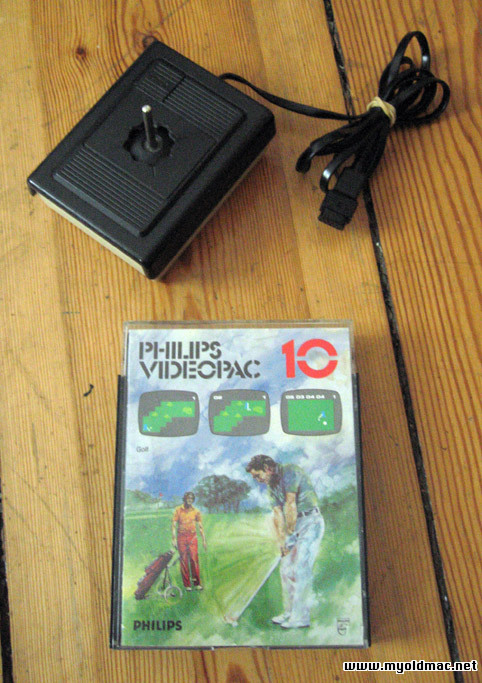 Die G7000 Konsole von Philips ist eine frühe (1978) Videospielkonsole, die ähnliche Daten wie die damalige Konkurrenz aufweist (z.B. Atari VCS2600). Allerdings ist das G7000 sehr schnell und von Haus aus mit einer Folientastatur versehen. In Amerika wurde die Konsole als Magnavox Odyssey² verkauft (Magnavox war eine US-Tochtergesellschaft von Philips). Die Konsole wurde immer mit zwei 8-Wege-Joysticks geliefert, bei älteren Revisionen sind diese fest mit dem Gerät verbunden (diese hat fest verbundene). Dies ist die erste, seltene Version mit internem Netzteil. Die Konsole ist getestet und funktioniert. Die G7000 hat nur leichte Gebrauchsspuren (sehen Sie die Bilder).